"Shelley came highly recommended by my therapist, for dealing with a complicated divorce with a highly emotional and potentially volatile spouse. Ms. Kester was knowledgeable, prepared, compassionate, and I felt a sense of calm with her reassurances while I was in her presence. She worked hard, long hours when timeliness was critical for a desirable outcome. Eventually everything worked out exactly how I had hoped it would, thanks to Shelley’s competence and commitment." "Melissa was very helpful on numerous matters regarding my ex-husband. She listened, offered quality advise and kept me informed of what was going on. Not only was she supportive professionally, but also in a kind, personal manner." "Melissa did an amazing job on my behalf during a recent reworking of an in-place JoD. I felt that she has a great sense of what is truly important and super attention to detail. She worked hard, yet efficiently, to get me where I wanted to be and represented me very well at a hearing." "Melissa's expertise regarding my situation was unprecedented. Her extensive knowledge and experience allowed me to put my complete faith and trust in her ability from day one. Her relationship with the court and the government agencies involved speaks volumes about her integrity and status in the area of child/family law. Melissa was able to develop a plan to protect myself and my family while reaching the best possible outcome for all those involved. I always felt throughout this process that my case was a top priority for her and I cannot say enough about how well Melissa handled this case." 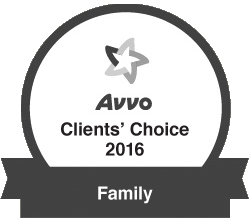 We are proud to have earned the Avvo Clients’ Choice Award. It’s important to us that our clients feel they’ve been represented with fairness, dignity and respect. We appreciate the acclamations of our past clients and are dedicated to superior service and support for our future ones.